Map showing the search routes for Sir John Franklin's lost (and recently found) ships. The larger, more southern blue circle indicates the area that Erebus was found, whereas the smaller more northern blue circle indicates the area that the Terror has allegedly been found. All 129 men on the Franklin expedition died, in the worst disaster to hit Britain’s Royal Navy in its long history of polar exploration. Search parties continued to look for the ships for 11 years after they disappeared, but found no trace, and the fate of the missing men remained an enigma that tantalised generations of historians, archaeologists and adventurers. under 80 feet of water by the Arctic Research Foundation. 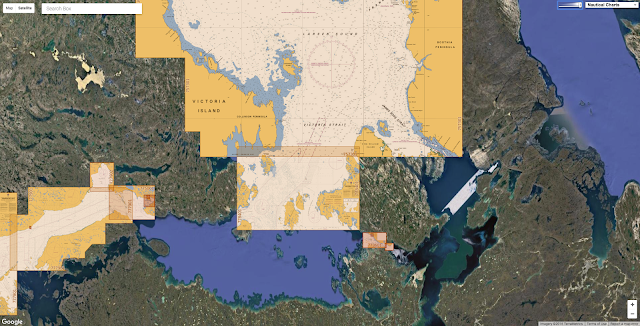 May 19th 1845: Under the command of Rear Admiral Sir John Franklin, the largest and most well equiped Arctic Expedition of it's time set out in search of a prize that had claimed the lives of countless others before: The Legendary Northwest Passage, a trade route around the frozen wastes of the North American Arctic. Equipped with the latest charts, equipment 3 years worth of provisions, packed within tinned food cans, and 129 Officers, Sailors and Royal Marines from the Woolwich Division's Light Infantry, few doubted the expedition would be a success and for those who set out it was to be the adventure of a lifetime, another triumph of British Science over nature. 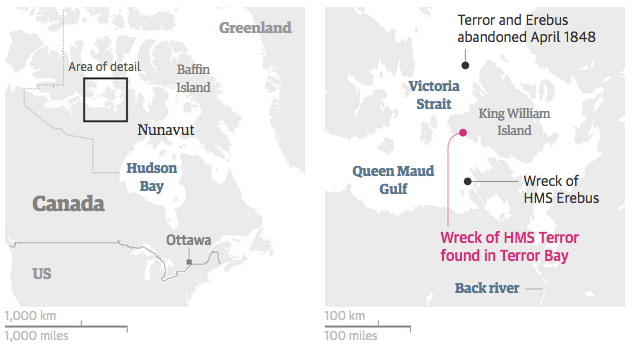 Yet as the HMS Erebus and HMS Terror entered the frozen wastes of the Arctic, what was to be a great adventure became a living nightmare when the Erebus and Terror became trapped in the ice off King William Island and the men soon discovered their 3 years worth of food had become poisoned by lead from the cans it was kept in. For nearly a decade the trapped men would slowly succumbed to the toxic food, disease, starvation, madness, the elements and desperate attempts to reach safety. “This vessel looks like it was buttoned down tight for winter and it sank,” he said. “This discovery changes history,” he told the Guardian. Parks Canada underwater archeologists have led the mission since it began in 2008. Now they must confirm the wreck is Terror, either by examining the foundation’s images or visiting the site themselves. With the first winter snow already falling in the High Arctic, Terror Bay will soon be encased in thick sea ice. The same stories described startled Inuit stumbling upon a large dead man in a dark room on the vessel, with a big smile. Experts have suggested that may have been a rictus smile, or evidence that the man had suffered from scurvy. Parks Canada archeologists found Erebus standing in just 11 meters of ocean. Sea ice had taken a large bite out her stern, and more than a century of storm-driven waves had scattered a trove of artifacts around the site.